Who Doesn’t Like a Picnic! ~ On Tuesday, August 2nd, we proved that we all do. But even something as “relaxed” as a picnic requires a lot of planning and hard work, and Blessed Trinity was up to the task. And so we send heartfelt thanks to everyone who played a part in making National Night Out and the Catholic Churches of Central Buffalo’s (“CCCB”) “Summer in the City” such an enjoyable evening. We won’t name names, but you know who you are: the folks who arranged for donations; gathered the grill and tents and shopped for essentials; made sure there was ample ice to keep all the drinks cold; hauled tables and chairs; set up games and erected canopies; prepared side dishes and desserts; provided entertainment for the children; endured the fire and smoke to grill our hot dogs and hamburgers; made numerous trips up and down stairs with food and utensils – and then did it all in reverse at the end of the night as we put everything back in its place. Whew! In between, we hope you all enjoyed meeting and dining with neighbors and dancing to the music of J.J. Williams. Thanks again to a wonderful team of BT volunteers. 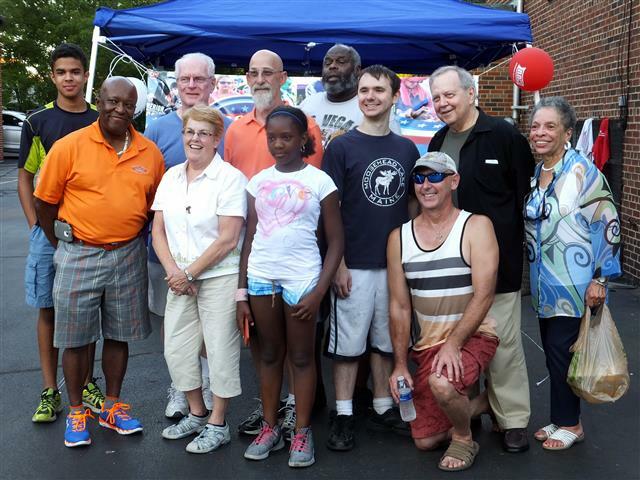 Click HERE for a photo gallery from our National Night Out celebration.